Writers don’t only have to decide which character’s point of view the story will be told in, they also have to figure out whether to then share that character’s narrative in first-person, third-person, second-person, or (*cue ominous rumbling*) omniscient POV. The point of view (or POV) in which you tell your story’s narrative is arguably the single most important decision you can make about your book. POV will affect every single word choice. It will decide which scenes are included and which are not. It will influence your readers’ perception of your characters. It may even dictate the plot itself. I get a lot emails from authors who are confused about omniscient POV. Most of them are getting slapped on the hand by editors for using it. Some are astonished to learn there even is such a thing, much less that it’s frowned upon. Omniscient POVs have a grand tradition going back to the beginnings of literature, and it’s no wonder many authors default to omniscient POV, since this is the narrative voice in which most of us humans tend to verbally share stories. Why All the Fuss About the Omniscient POV? So what’s the problem with the omniscient POV? Why are so many authors confused about it? And why are so many editors delivering digital hand slaps because of it? Omniscient POVs are tricky. I have to admit, I always wince (just a little) whenever authors tell me they’re writing in omniscient. I’ll admit this upfront: not a big fan of the technique–if only because there is so much more intimacy to be found in the tighter POVs of first-person and deep third-person. Furthermore, because omniscient is a POV that has largely fallen into disuse, it can be a harder sell to agents and editors. However, that isn’t to say the omniscient POV can’t be wielded effectively. We definitely do still see a book here and there that uses it (usually in the literary genre). But the omniscient POV can be challenging to get right. Authors often struggle to maintain a consistent omniscient voice and figure out how the omniscient POV differs from random head-hopping (which dips in and out of multiple characters’ tight narratives without warning). Perhaps you’re one of those authors who is considering an omniscient POV for your story, or perhaps you’re already wielding an omniscient POV and struggling to understand why you’re taking flak for it. Today, we’re going to explore what makes the omniscient POV tick and how you can figure out if taking the chance on it is the right choice for your story. What Is the Omniscient POV? Just to make sure we’re all on the same page, let’s start with a quick exploration of the differences between the four major types of POV used in narrative fiction. As its name suggests, the omniscient POV is one that tells its story from the perspective of a narrator (usually–implicitly–the author himself) who “knows all and sees all.” This narrator is rarely characterized or explained, and readers accept this without ever wondering who is telling the story. This narrative functions on the idea that the author/narrator already knows how the story will end. He is able to observe the thoughts and motives of all the characters (although still within certain limits, as we’ll discover in a minute). The omniscient narrative does not tell the story from the perspective of any particular character; rather, it observes all the events in an unbiased fashion and reports back to the reader. The third-person POV tells the story in the third-person, referring to all the characters with the third-person pronouns “he” and “she.” Technically, the omniscient POV is also told in third-person, but the distinction is that a deep or tight third-person POV restricts itself entirely to the perspective of a single character within any given scene. Usually, the protagonist is the primary narrator. Only details observed by the POV character or knowledge he has personally gleaned or assumed can be shared (i.e., if the narrator doesn’t know another character’s mother died, then the narrative can’t share that information with the readers). In a first-person POV, the protagonist himself is telling the story directly to readers and referring to himself by the first-person pronouns “I” or “me.” Like deep third-person, first-person is entirely restricted to the thoughts and observations of the narrator. He can’t dip into the thoughts of other characters for the obvious reason that he can’t read their minds (unless, of course–he can). The second-person POV is used only rarely. It tells the story using the pronouns “you” or “your” to refer to the protagonist–in essence, making the story about the reader. The key to wielding an effective omniscient POV is all about maintaining a uniform narrative voice. The omniscient POV allows you to dip into multiple characters’ heads, but you will be acting more as an observer than a reporter. As a result, the omniscient POV is much more prone to telling, rather than showing—which means it’s (ironically) a much less immersive style than deep third-person or first-person. The omniscient narrator observes the characters and draws in-the-know conclusions about their thoughts—rather than reporting the blow-by-blow, in-the-minute firing of their synapses. An omniscient narrative is sort of like you telling your friend about the plot of a movie you watched. Because you’ve seen the movie, you know how the story’s going to end and you can make educated guesses about the characters’ actual thoughts during the story–but you’re not in their heads as you’re re-telling their story. What’s the Difference Between the Omniscient POV and “Head Hopping”? A lot of authors who attempt the omniscient POV get shot down on accusations of “head hopping.” Head hopping is the common gaffe that occurs when the narrative breaks “out of POV” and jumps without warning from the perspective of one character into the perspective of another. The key to understanding how omniscient POV differs from head-hopping is in our definition of character “thoughts.” In a deep POV, every word of the narrative is technically going to be taking place inside the narrator’s head–and therefore is part of his thoughts. That’s not the case in an omniscient POV. Rather, in the omniscient POV, the narrative is free to observe the mindsets of various characters. What it’s not free to do (at the risk of confusing readers) is portray those thoughts in the unique and personal voices of the individual characters. Basically, what that means is that direct thoughts are pretty much off-limits (although there will always be the occasional exception to confuse things). Jeb stared out the windshield. Man! I just want this stupid vacation to end, so we can go home. Beside him, Sally studiously flipped through her magazine. I don’t care what he says. I’m staying. In the backseat, Billy covered his ears with his hands. Even when they’re not fighting, they’re fighting! The problem with the omniscient POV—and one of the big reasons editors are no longer so keen on it—is that it’s dad-blamed tough to write. As you’re learning, this is largely because it’s a difficult concept to get our heads around in the first place! That isn’t to say editors won’t accept it (Audrey Niffenegger’s sophomore novel Her Fearful Symmetry was omniscient–and earned an advance of $5 million in a bidding war between publishing houses–largely, on the blockbuster success of her previous book, the first-person Time Traveler’s Wife). What editors will always be looking for in an omniscient POV (or any POV, come to that) is an amazing narrative voice. That voice needs to be not just something that serves the story, but something that pops off the page and pulls readers in. That kind of voice can be more difficult to accomplish in an omniscient POV, if only because the narrator’s voice is much harder to define. Do you still feel the omniscient POV is the right choice for your story? The best way to learn how to write powerful omniscient POVs is by reading masters (Dostoevsky’s Brothers Karamazov comes to the mind). Read omniscient POVs like crazy and take apart the narratives until you get a feel for how they work and how you might apply them in your story! Wordplayers, tell me your opinion! 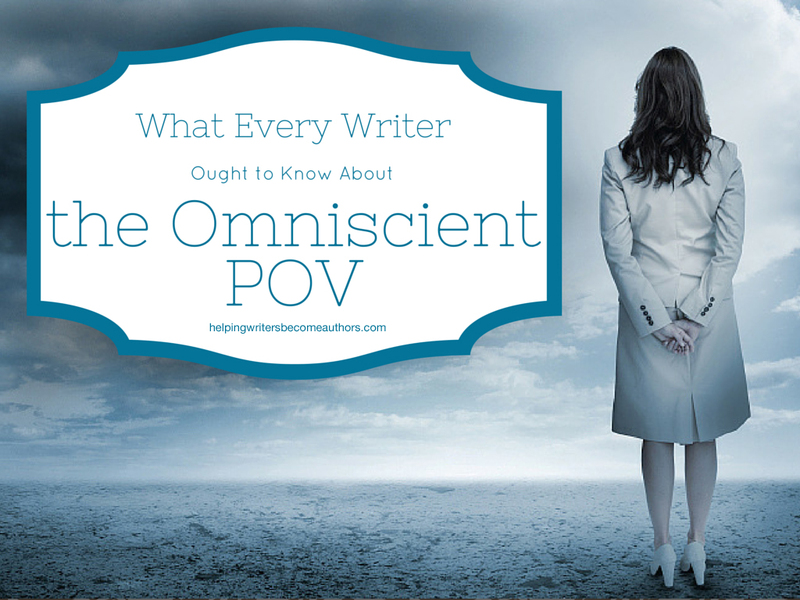 Have you ever considered using the omniscient POV in your stories? Why or why not? Tell me in the comments! occurs when the narrative breaks “out of POV” and jumps without warning from the perspective of one character into the perspective of another. I like to think more of my readers than that. I’m always struggling with the concept of narrative point-of-view — specifically, because I sometimes write in Third Person Omniscient, and I am told that I break the point-of-view by some, not all, individuals. But I think a lot has to do with the different shades of Omniscient narration, of which not everyone seems to be aware. After that, you give two examples. The problem, for me, is that I have been taught that there is a distinction to be made between Third Person Omniscient Objective, and Third Person Omniscient Subjective (yet it seems few others have been taught this). In the Objective variety, you would adhere to the rule you stated, like Hemingway does in “Hills Like White Elephants,” not giving access to the characters’ direct thoughts, and not really allowing the characters’ voices to color the narrator’s voice. The narrator would also not be able to use strong words demonstrating what the character is thinking or feeling. He would have to be limited to observable action, and could only record feelings or thoughts the characters articulate out loud. Note, however, in “Hills Like White Elephants,” there is one sentence where Hemingway does break the rule, using the adverb “reasonably” to indicate what the male character is thinking about the other people in the bar. Even though the voice is still clearly written overall in the dry and neutral language of the rest of the story, the use of the adverb is clearly not the narrator’s thoughts, but rather the character’s feeling superimposing itself over the narrator’s words, which violates one of the strictures of writing in Third Person Omniscient Objective. Even if one argues that it’s not the male character’s feeling, but rather the author’s observation, it still violates the rules of Third Person Omniscient Objective, since the narrator is not supposed to pass judgment on the events or characters, but rather is to transcribe them. When it comes to Third Person Omniscient Subjective, things get a bit trickier. The narrator is not simply a neutral fly on the wall, but rather an individual with personality. You can see this clearly in novels like “The Lord of the Rings,” or “The Hobbit,” where the narrator comes across as a humorous and comfortable personality well familiar with the histories of Middle Earth, and the narrator is choosing which scenes to present to the reader (like a grandfather telling his children a bedtime story); the narrator, of course, seems most interested in the points-of-view of Bilbo and Frodo, so will continuously hone in on Bilbo and Frodo at appropriate times in the narrative to tell us what they are feeling and thinking. This is where your rule is at odds with some popular fiction. In these instances, the Omniscient Subjective narrator will not only tell us the following: “Bilbo wondered how many golden coins he could steal,” but he will also include direct thoughts from the characters in italics: I wonder how anyone can see in such a dark place as this, wondered Bilbo. In these books, the Omniscient Subjective narrator is free to pass judgment on the characters (Tolkien speaking many times about Bofur’s weight); he is free to indicate what a character is thinking or feeling about another character; and he is also able to present a character’s direct thoughts either in italics, or in quotation marks, whichever he chooses at the time to help the reader have a greater closeness with the character on which he has focused. What’s more, the Omniscient Subjective narrator can reveal multiple points of view mid-scene, as long as he does so sparingly, and does not alienate or confuse the reader. This is really where personal sensibility and preference come into play, and will be a point that the writer might have to defend. It either works, or it doesn’t. It seems conservative editors really dislike these techniques, but seem to forget that cinema has conditioned many people to be open to such moments in literature, as long as the story plays in their minds like a movie, and they don’t sense some internal violation, or an obvious reel change. In “Little Women,” Austen clearly uses an Omniscient Subjective narrator, who is very opinionated, as a way of showing the reader the social mores of the time; but she keeps herself from dipping into the characters’ minds directly and so contrives passages where the characters are speaking aloud to themselves (like Lewis Carroll’s Alice), privately, of course, to reveal to the reader what they are thinking secretly. On the other hand, Dickens, who also uses subjective Omniscience in much of his fiction, doesn’t always feel the need to have his characters wonder aloud for the sole purpose of revealing their inner thoughts; he will at times dip into their minds and allow their own voices to superimpose themselves over the narrator’s voice. The reality is that it’s a narrator who so despises what Scrooge used to be, and is so acquainted with the repugnant traits of his character, that the narrator is able to imitate Scrooge and to anticipate what Scrooge’s characteristic responses would be to subjunctive moments and situations. This is not narrator confusion, but rather the narrator imitating the voice of the character he is following (note: I have ran into individuals who think that “A Christmas Carol” is third person limited with omniscient moments). To add to the confusion, novels and popular fiction change POV without regard to the rules. For example, in Rowling’s “The Sorcerer’s Stone,” the novel uses Omniscient Subjective narration to hone in on Mr. Dursley, stays in Third Limited to explain Dursley’s observations of strange and peculiar happenings, then switches to Omniscient Objective to break away from Mr. Dursley to the outside of Privet Drive (where the Dursleys live) to introduce the reader to Dumbledore (using the the presence of Minerva McGonagal, disguised as a cat, as the transition device between Durlsey and Privet Drive); and then in Chapter Two, the narration begins with Omniscient subjective to once again pass judgment on the Dursleys, and to demonstrate the passage of years, and then locks onto Harry’s POV, and officially becomes Third Person Limited for most of the book at that point forward. So, how is a writer to continue to write in Third Person Omniscient Subjective when many individuals do not seem to be aware of the difference between Third Person Omniscient Subjective and Third Person Omniscient Objective? And even in the instances where editors and writers agree there is such a distinction between the two, they mostly disagree as to what can and can’t be done in Third Person Omniscient Subjective. From my readings and my conversations with writers and professors, I have concluded that Third Person Omniscient Subjective is the least understood when it comes to what the narrator can and can’t reveal about the characters’ thoughts and feelings. Also, many disagree on “how” the Omniscient Subjective narrator can reveal character thoughts and feelings, some feeling it’s a no-no to reveal them directly; some feeling equally strong that the narrator can reveal them directly, as long as it’s clear. However, most agree that the Third Person Omniscient Subjective narrator can have a very lively and entertaining voice, unlike Omniscient Objective which must remain neutral at all times. Besides industry-related trends, is Omniscient narration falling out of use because there is no definitive consensus as to the different shades of Omniscience? It seems that Omniscient Subjective narratives have the most variety, and really it’s up to the writer to remain consistent. But how is a writer to achieve consistency if publishers themselves are not aware of all the shades of subjective omniscience and might mistake consistency for an unmotivated POV switch? Wow, great points, Gabriel! You’ve raised some things I haven’t really considered myself. I hope everyone who reads this post also comes down to read your comment. Ultimately, I think there are two big answers to the questions you’ve raised. 1. POV is more fluid than we sometimes pretend. However, the reason we impose such strict rules on it is because it’s so much easier for authors to produce a crisp narrative from within those rules–and, likewise, so much more difficult to manage the vast fluidity outside of those “rules” and still end up with a great narrative. In short: an author is free to use just about any blend of any of the recognized POVs if it works–which is a very tall order indeed. 2. Like it or not (and many, many authors don’t), omniscient is out of style. Editors and agents do not like it, some to the point they’ll instantly stop reading when they discover it. This isn’t to say it’s not still a valid style, and one that some authors still find success with, but it’s a very tricky style for beginning authors to try to break out with. Gabriel — You’ve clearly given Omniscient POV more thought than have a lot of the editors and agents who would reject it at first glance. If you’re doing it with control, you can get away with it. A few writers have lately, though mainly in literary fiction, like Celeste Ng (Everything I Never Told You) and Anthony Doerr (All the Light We Cannot See). As for voice in Omniscient viewpoint: the _narrative_ should remain in the narrator’s voice but, as you point out with the Bilbo example, the characters’ _internal monologue_ can be in their own voices. Internal monologue is treated like dialogue rather than narrative. You ask, “Besides industry-related trends, is Omniscient narration falling out of use because there is no definitive consensus as to the different shades of Omniscience?” Industry trends are the main issue. Readers prefer deep viewpoint because it allows them to attach more closely to the characters. With Omniscient viewpoint there is always an intermediary. Apart from industry trends, I think you are correct—the main reason omniscient viewpoint is out of favor is because not many teachers are providing instruction in it, and they’re not providing instruction because they don’t understand all of its complexities. If I am starting to outline a literary novel containing lots of homage and references to LOTF, would it lose effect if it was not written in Omniscient POV? By the way, I do not need readers to identify with a character as much as usual. Like LOTF it is more of an allegory for problems is America. I would say you could do that in any POV. Fine, based on this article (and it is well written and informative) I head hop. However, I am aware that I am relating information from a different character POV and I make sure the reader is absolutely aware of that. The story is told from the POV of the narrator and everything always goes back to that POV. I use a like-deep-POV technique where I sometimes relate the main character’s actions in a way that seems like deep POV, but is from the narrator’s (the book’s defeult) POV and sometimes it’s cut and dry narrative exposition, but I limit that because it is borring and droning sometimes. Anyway, I do like head hopping if done correctly. If it is related in such a way that you are clearly aware the narrator is omniscient and so of course he/she’d know all about everything (although it mauy not be related) then if you’re aware of the head hopping (it’s clearly cued in one form or another) what’s the big deal? If the story is set up around an extreme omniscient “the narrator is god so he/she can do what ever they want, including even stop time or shift space by flying the reader over the city to another part of town to watch something else happen then bring them back to finish the scene that is happening at the same time…and whatever other fantastic thing necessary to relate the story’type of story telling technique and it’s clearly done in a “with respect to the reader” type of way then what’s wrong with that as long as it is controlled, properly cued, and with respect to the reader? The novel I’ve written, and am now proofreading, is sort of like a movie, except with the added literary techniques of exposition, character internal thoughts, and feelings…which cannot be related in a movie. I want the novel to be basically a movie that is unique to each person who experiences it because they have to imagine it for themselves based on the written words. What’s wrong with head hopping as long as it’s not just jumping around with no regard for consistency? …and furthermore, would what I describbed above really be head hopping in the first place? Yes, what you’re describing is head-hopping. The problem with head-hopping is that it demonstrates a lack of control and focus in the narrative. Sometimes the expansiveness it offers readers is worth the risk; however, it often comes across as self-indulgent on the author’s part. That said, as with all things in writing, if you can do it in a way that works, that’s all that matters. In my historical novel I’m writing in multiple third person PVOs, but not hopping PVOs within a chapter, EXCEPT that in many chapters I include a minor section as a narrative from an Omniscient POV. Can I get away with this mix? It depends if the omniscient section is set apart from the other in same way as a separate POV. I think I fall back onto omniscient POV, because to me, it flows better. Of course, I’ve been accused many times of telling instead of showing. Now I know why. Thanks for the insights, K.M.! Same with me! It’s also interesting, because apparently as a reader I’m definitely a fan of Third Person and when I go and re-read my stuff, it comes off as stiff. Apparently it’s easier for me to write Omniscient but harder for me to read it. So is there a difference between omniscient third and free indirect speech/style? Because they sound really familiar accept that free indirect style (according to editor Shawn Coyne) is able to get away with more dramatic shifts in pov that would be considered head hopping in omniscient. Are they actually the same? or if they arent, is indirect style considered bad now and Shawn Coyne is full of it? Also, isnt Silence of the Lambs written in free indirect style? Quoted or direct speech: He laid down his bundle and thought of his misfortune. “And just what pleasure have I found, since I came into this world?” he asked. Reported or normal indirect speech: He laid down his bundle and thought of his misfortune. He asked himself what pleasure he had found since he came into the world. Free indirect speech: He laid down his bundle and thought of his misfortune. And just what pleasure had he found, since he came into this world? Oh! that cleared it up a lot thanks! ur explanation gave me that aha moment!